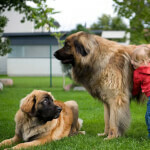 The Leonberger is truly a gentle giant and he is certainly playful and friendly. Tremendously calm, confident and good-natured, many are reminded of the 'King of the Jungle'. Although always graceful and powerful, there are other reasons the Leo is likened to a lion; they have a characteristically abundant coat and males sport a "mane" on the neck and chest. Bred originally to be the perfect family companion, this breed is just that and; even strangers and other pets will find these guys sociable and friendly. Although they may sound like the clear choice, this breed is not for everyone; grooming, training and exercise all require a high amount of effort. They are shedders and heavy cleanup will be required twice per year. They need companionship and attention from their family and are adaptable to many different living situations, provided they get enough exercise. 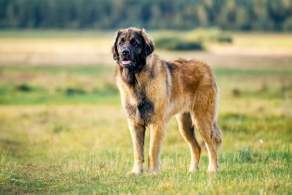 Although they have quite a few possible health concerns, they have a decent lifespan for a giant breed (around 8-9 years). Below are the details and specs for the Leonberger dog breed. The Leonberger is a huge dog; males and females are easily distinguishable by size. The male is typically 28-31.5 inches at the shoulder while females are 25.5-29.5 inches. Weight for males is 120-170 pounds for males, females 100-135 lbs. The ideal family companion, Leos are sociable with friendly strangers and other pets, and excellent with children. They are calm, gentle and intuitive while still managing to be friendly and playful. These dogs are moderate to high maintenance when it comes to training, grooming and exercise. Daily brushing, outdoor exercise and training refreshment is required. They also are primarily family companions and will be at their best when around you and participating in activities with the "pack". Heinrich Essig, a councilman in Leonberg, Germany, is credited for creating this breed in 1849. Desiring a reincarnate of the lion on the town crest, he crossed Saint Bernards, Newfoundlands and Pyrenean Mountain Dogs (although geneticists insist there must be more breeds involved). The result was the massive Leonberger, which was so popular, they were given as gifts to royalty; even the Prince of Wales and Czar of Russia owned one of these dogs. In 1889 the first clubs were founded for the breed including the "Internationaler Klub fur Leonberger Hunde Stuttgart", which created the first breed standard. Many canine populations declined during WWI and after this time two men, Stadelman and Josenhans, began a new breeding program to revive the Leo; there was later a committee made for this purpose after WWII (during which time the German government closely restricted breeding). In America, the Leo saw the best revival since the Depression during 1975-1985 and the Leonberger Club of America was formed in 1985. 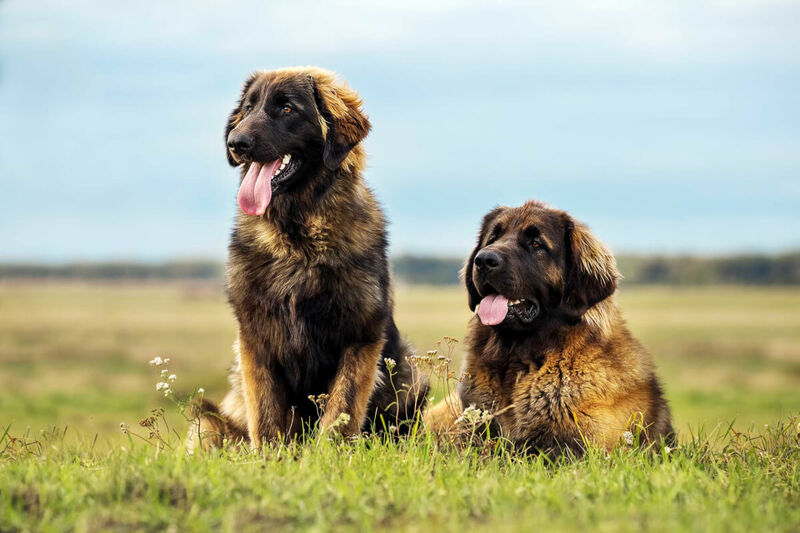 The AKC officially recognized the Leonberger as its 167th dog breed in 2010. 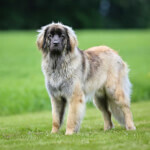 This breed is very large but well proportioned; males are easily distinguished from females by size and other traits such as an abundance of hair (mane) on the chest. With a broad, deep chest and well-muscled legs that are straight and strong, the Leonberger could be mistaken for a proud lion. 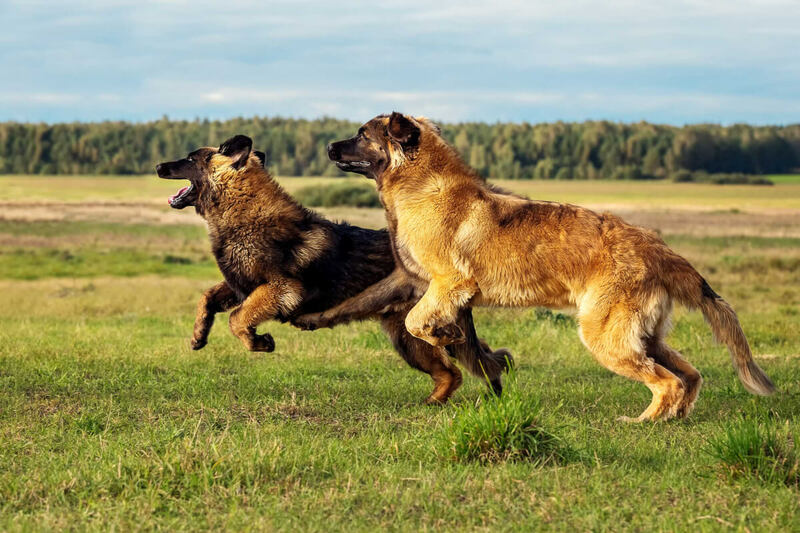 They have a waterproof double coat consisting of a short, dense undercoat and a medium-long outer coat that is shorter on the muzzle and front of the legs. The coat is feathered on the backs of the legs and the ears, while the tail also has no lack of hair. Owners usually choose to keep the coat natural and it is imperative to do so if you wish to show your dog. Overall, they possess a calm, good natured expression in their dark brown eyes. The ears are medium sized, triangular and hang close to the head. Red, reddish brown, sandy and yellow are the permitted colors according to the AKC and they always have a black mask on the face. A white stripe or patch on the chest is also permitted. The undercoat will be lighter in color but will blend in so as not to be distinguishable from afar. The Leonberger if one of the biggest dog breeds-- Leonbergers are giant, huge and the paw of a fully grown Leo can easily match the hand of a 6 foot tall man! 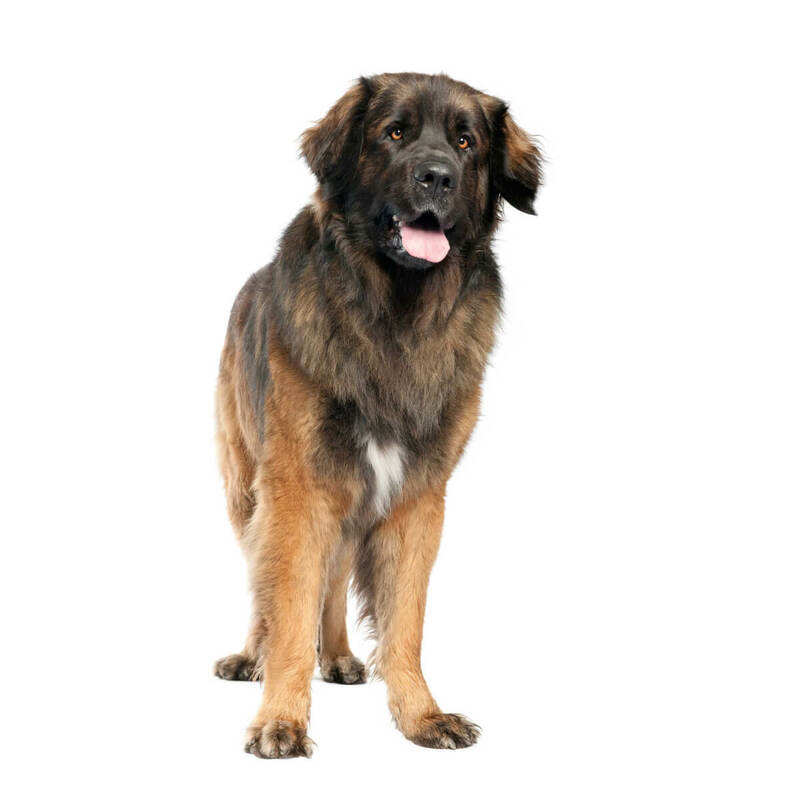 The largest Leonberger can weigh around 170 pounds. These gentle giants are perfect for owners specifically seeking a large dog breed with a sweet personality. For those in love with the breed but not the size, Leonburgers have no mini size variations. In fact, doing so would either include breeding the smallest (potentially unhealthy) individuals or introducing a completely different breed into the mix. Additionally, the Leonberger is a big dog with a big coat. It is lush, thick and sheds all year-round. 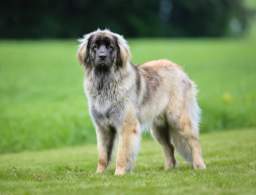 You are extremely unlikely to ever come across a clipped Leonberger, but if you do you can guarantee the owner has shaved or clipped him/her. Leos were bred to be companion and watch dogs; in fact, they were meant to be the perfect family dog. If trained and socialized as a puppy, your dog will be a list of wonderful things including: patient, calm, good-natured, loving, family oriented, bright, playful and friendly. Sounds good? Well, Leos aren't for everyone. 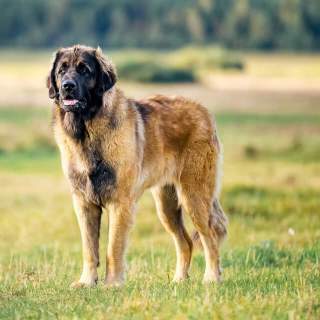 A fully grown individual of this breed weighs over 100 pounds; that's a lot of dog if you do not have time to patiently and consistently train them as puppies. You must be able to confidently establish yourself as the pack leader and they will adapt to any role to please you. 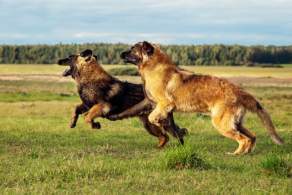 They will master basic commands like "sit, stay, down" with relative ease but do not excel in agility and obedience training. They are often bored by the tasks of retrieving continuously and do not enjoy those types of games. These dogs are sociable with strangers, wonderful with kids and good with other pets due to lack of hunting instincts. They are noted for their natural gifts as therapy dogs, don't mind being held onto and are even said to "lean on" owners themselves. Despite the size and musculature of the breed, they were intended primarily as companions and have "house-dog" temperament. Due to their intuitive nature they are able to adapt to a variety of working and living conditions. 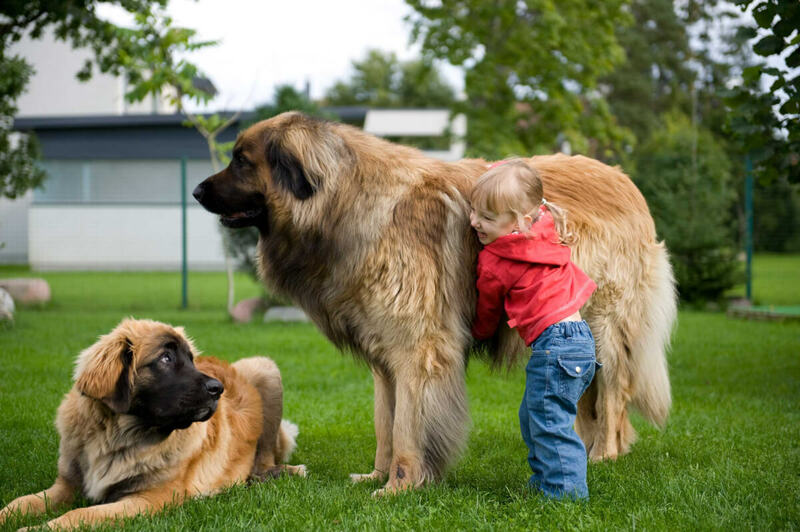 Leonbergers are naturally a family dog. Families and children adore them not only because of their playfulness but also their gentle, patient demeanor. They are very large and may accidently knock over a child but, beyond that, they are one of the best companions that could be found. Leos tend to get along well with other pets, especially if socialized at a young age. They are not aggressive or territorial and lack natural hunting instincts. These traits make them good with dogs and cats alike! Members of this breed are friendly and never aggressive. They are confident and good-natured, greeting non-threatening strangers. This is definitely a social dog and will be popular at gatherings, however, their deep bark and extra-large size are sufficient to keep ill-wishers at bay. 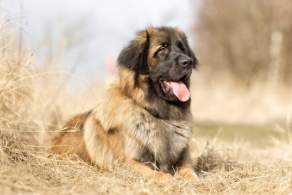 Below are pictures and images of the Leonberger. These dogs are moderate to high maintenance when it comes to training, grooming and exercise. Most owners choose to leave their natural coat intact, so daily brushing is necessary. They are large and playful, requiring daily outdoor walks and playtime. Training is not without effort either. Leos need patient, firm, consistent training and, although eager to please, even then will likely excel in little more than basic commands. Members of this breed enjoy being around you and the "pack" and will desire regular attention. 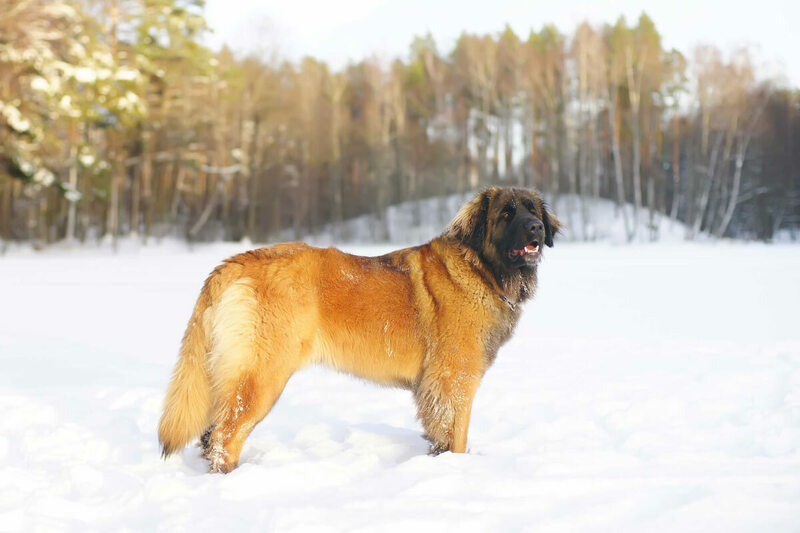 Leonbergers are impressive looking dogs with their abundant double coats. Nearly all owners (especially if they choose to show their dogs) choose to leave the coat natural; no clipping, cutting, etc. is necessary. Daily brushing, however, is a must along with occasional bathing, nail trimming, ear and teeth cleaning. They are moderate shedders (and heavy twice per year) but not necessarily droolers, although after drinking they may trail some water. Due to their gigantic size and history as a working dog, your Leo will need plenty of exercise. Luckily they are so laid-back they enjoy, and are good at, many things: hiking, swimming, herding, carting, rescue work and therapy work are just some of the things they enjoy. They will be just as happy to exercise with you, just make sure they get plenty of outdoor time since they are naturally energetic and playful. They do not bark frequently and are calm dogs that will thrive indoors alongside the family; as long as there is enough space for them within your home they can adapt to a variety of living environments. 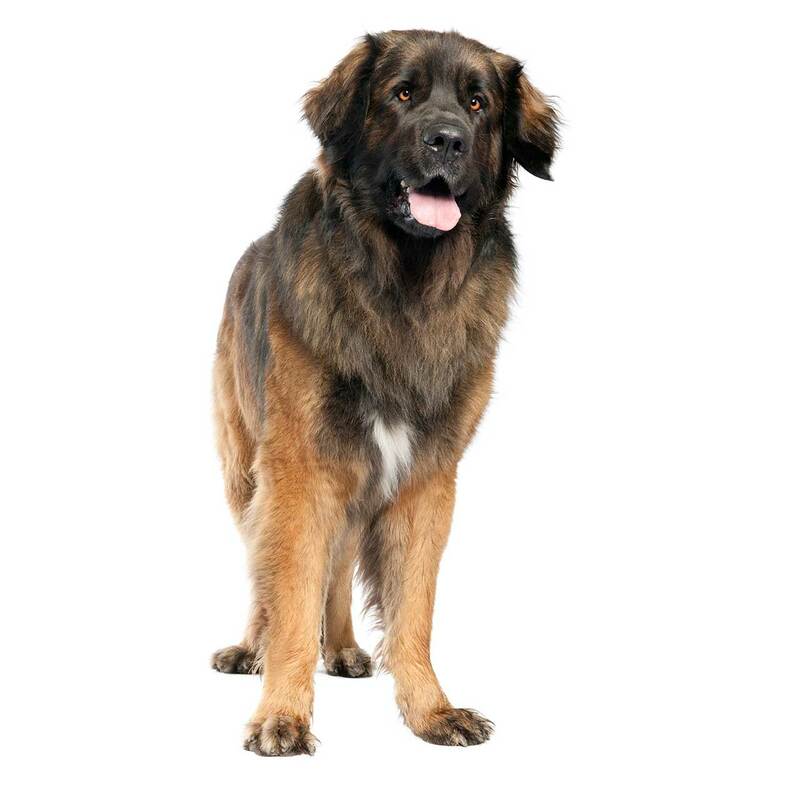 Leonbergers are quite large and likely not ideal for small apartment living. Although a large yard will be good for them, they should not spend all their time outdoors. They were primarily bred to be a family companion they will want to be near you and part of the "pack". This breed has a thick, waterproof double coat. They will do well in cold weather, snow and rain but not in very hot climates. Only twenty percent of Leonbergers live past age 10 with the median being 8 years. Bloat, as well as hip and elbow dysplasia are common within large breeds. Another bone related problem, Eosinophilic Panosteitis, can afflict them during puppyhood but this bone inflammation generally corrects itself in time. Entropion (inward positioned) and ectropion (outward positioned) eyelids are a minor issue for these dogs. Polyneuropathy (peripheral nerve damage) is common and a source of discomfort for this breed; this can be evaluated at your checkup. Your Leo should also be tested for Addison's disease, as it is common to the breed and is an adrenal disease that can result in death if not kept in check. Bone cancer is a major killer of large dog breeds so it is important to take your pet to scheduled veterinary visits.